One of the many posters around Hamburg advertising the celebrations. Predating the Ring Cycle, Wagner's Tannhäuser is no less impressive in scale and imagination when tackled by the Hamburg State Opera for their Wagner Wahn festival. The music of Tristan is revolutionary, literally from the first chord onwards, and so the Hamburg State Opera succeed in making the staging suitable radical. Wotan, king of the Gods, and Alberich, the scheming dwarf who renounces love, thrash out their differences on another huge set. Another show-stopping set from the creative minds of the Hamburg State Opera, led by their inimitable creative director Simone Young. Erda, the earth Goddess, turns up in the fourth act of Das Rheingold to convince him to ignore his pursuit of power with the Ring itself. In the Hamburg production. Wotan's cunning servant Loge is presented as a sparkly-suited magician, never too far away from an improvised pyrotechnic or a scarf up the sleeve. The centrepiece of Hamburg's Das Rheingold is a revolving model of the mountains. Nibelheim is presented as a dark, industrial nightmare world, complete with malfunctioning machinery and sparking circuitry. Hamburg's Das Rheingold also makes innovative use of shadowplay and video cameras, at one point showing footage of the singers as they perform, occasionally getting the orchestra and the audience in shot. 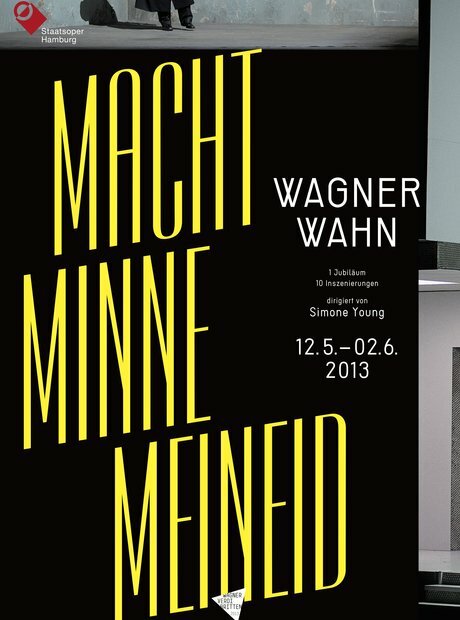 Another cool poster publicising the Wagner Wahn festival.